Erythromycin production often has concern with the consumption rate of amino nitrogen and phosphate, especially in the early fermentation phase. The dynamic regulation of nitrogen and phosphorus was put forward based on the comprehensive analysis of the contents of phosphorus and nitrogen in different nitrogen sources as well as the relations between nitrogen consumption and phosphorus consumption. Firstly, the unstable nitrogen source, corn steep liquor, was substituted with the stable nitrogen source, yeast powder, with little effects on erythromycin production. Secondly, feeding phosphate in the early fermentation stage accelerated the consumption of amino nitrogen and ultimately increased erythromycin production by approximately 24% as compared with the control (without feeding potassium dihydrogen phosphate). Thirdly, feeding phosphate strategy successfully applied to 500 L fermenter with the final erythromycin concentration of 11839 U/mL, which was 17.3% higher than that of the control. 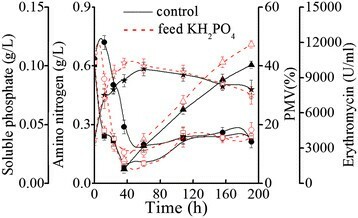 Finally, the application of condensed soy protein (a cheap nitrogen source with low phosphorus content) combined with phosphate feed strategy led to a 13.0% increase of the erythromycin production as compared with the control (condensed soy protein, without feeding potassium dihydrogen phosphate). Appropriately feeding phosphate combined with rational nitrogen regulation in the early fermentation phase was an effective way to improve erythromycin production. Erythromycin is a kind of polyketide antibiotic produced by Saccharopolyspora erythraea through industrial fermentation. Recently, erythromycin has received much attention because its semi-synthetically modified derivatives, such as azithromycin, roxithromycin, and clarithromycin, are widely used in the treatment of infectious diseases ,. The high requirement of erythromycin market stimulates the research on the improvement of the production and productivity of erythromycin. It has been reported that the genetic engineering technology, such as Saccharopolyspora erythraea mutB knockout and artificial attB site, have been applied to improve erythromycin production ,. The variation of the medium composition and fermentation conditions also successfully improved the erythromycin productivity ,. Zou et al. reported that feeding corn steep liquor could regulate oxygen uptake rate (OUR) at a suitable level in the early phase of fermentation, elevate the intracellular levels of lactic acid, pyruvic acid, citric acid, and propionic acid, and ultimately enhance the metabolic flux of erythromycin biosynthesis . It is well known that the quality of corn steep liquor is unstable due to its production process and the difficulty to be stored . This led to the severe fluctuation of erythromycin production on industrial scale. In this study, yeast powder, a stable nitrogen source, was used to replace corn steep liquor, so that the erythromycin production could be maintained at a stable level. Our data showed that the erythromycin production was little affected by the substitution of corn steep liquor with yeast powder. Furthermore, it was found that phosphorus content limited the consumption rate of amino nitrogen. Compared with organic phosphorus, the concentration of inorganic phosphorus can be controlled quantitatively. In most cases, phosphorus is used as a crucial growth-limiting nutrient in antibiotic fermentations. The concentration of soluble phosphate generally fell in the range of 0.0003 to 0.3 mol/L. When the concentration of soluble phosphate was higher than 0.01 mol/L, the biosynthesis of many antibiotics would be suppressed -. 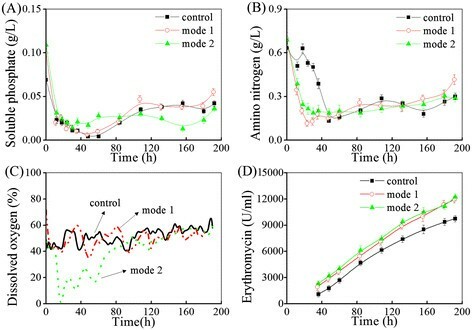 It was reported that the initial phosphate concentration of 0.0061 to 0.0096 mol/L was beneficial for the cell growth in the aminoglycoside antibiotic JI-20A fermentation  and feeding phosphorus could provide optimal conditions for penicillin G biosynthesis . In our previous work, it was found that erythromycin A production was increased by 8.7% through the rational regulations of phosphate salt, soybean meal, and ammonium sulfate . However, few studies, to the best of our knowledge, focused on the effects of initial phosphorus and feeding phosphorus in the early stage of fermentation on the erythromycin fermentation. Hence, the effects of adding and feeding potassium dihydrogen phosphate in the early fermentation phase on the erythromycin fermentation were investigated. The recombinant erythromycin-producing strains Saccharopolyspora erythraea ZL1004 is preserved in our laboratory . Preliminary seed medium contains (g/L) the following: starch 30, dextrin 40, soybean meal 20, CaCO3 5, NaCl 3, and (NH4)2SO4 2. Secondary seed medium contains (g/L) the following: starch 30, dextrin 30, soybean meal 30, corn steep liquor 10, CaCO3 5, and antifoam agent 1.25 mL. In the fermentation in 50-L fermenter, preliminary seed culture was transferred into a 15-L fermenter containing 8 L of the secondary seed medium and cultivated at 34°C for 41 h. Then, the secondary seed culture was transferred into a 50-L fermenter containing 30 L of fermentation medium and cultivated at 34°C for 190 h. The fermenter was an agitated bioreactor equipped with three turbine impellers and devices capable of monitoring more than 14 online measurable parameters (FUS-50, Shanghai Guoqiang Bioengineering Equipment Co., Ltd., Shanghai, China) ,. DO (dissolved oxygen) was monitored with polarographic DO electrode (Mettler-Toledo, Greifensee, Switzerland) and controlled in 40-60% of air saturation by adjusting agitation and aeration during fermentation. The original fermentation medium (g/L) consisted of starch 35, dextrin 5, soybean meal 30, corn steep liquor 18, ammonium sulfate 3.0, NaCl 2.0, CaCO3 7.0, and antifoam agent 1.9 mL. For the experiment group, corn steep liquor was replaced by 10 g/L yeast powder. The nitrogen content of 18 g/L corn steep liquor (0.734 g/L) was equal to that of 10 g/L yeast powder (0.736 g/L) based on their total nitrogen amount detected by the Kjeldahl method . Adding and feeding potassium dihydrogen phosphate in the early stage of fermentation. Strategy 1: adding potassium dihydrogen phosphate to the initial medium. Potassium dihydrogen phosphate was added before the sterilization of medium. The concentrations of potassium dihydrogen phosphate in the medium were set at 0.08 and 0.12 g/L, respectively, which were determined based on the difference of soluble phosphate concentration between yeast powder medium (0.07 g/L) and corn steep liquor medium (0.14 g/L). The levels of soluble phosphate and amino nitrogen were chosen as the indicator for switching on and switching off phosphate feeding. When soluble phosphate concentration was about 0.04 g/L, phosphate feed began. When amino nitrogen concentration was near 0.18 g/L, phosphate feed was terminated. The solution of potassium dihydrogen phosphate (10 g/L) was fed at the rate of 10 g/h in mode 3 and 20 g/h in mode 4, respectively. Preliminary seed medium and secondary seed medium were the same to the media used for 50 L fermentation. The fermentation medium was the yeast powder medium. Preliminary seed culture was transferred into a 100-L fermenter containing 60 L of the secondary seed medium and cultivated at 34°C for 41 h. Then the secondary seed culture was transferred into a 500-L fermenter containing 300 L of fermentation medium and cultivated at 34°C for 190 h (Shanghai Guoqiang Bioengineering Equipment Co., Ltd., Shanghai, China). The solution of potassium dihydrogen phosphate (10 g/L) was fed at a rate of 100 g/h when soluble phosphate concentration fell to about 0.055 g/L and ceased to feed when amino nitrogen concentration was close to 0.18 g/L. The condensed soy protein medium (g/L) consisted of starch 35, dextrin 5, soybean meal 30, condensed soy protein 7, ammonium sulfate 3.0, NaCl 2.0, CaCO3 7.0, and antifoam agent 1.9 mL. The phosphate feed strategy was the same to that of mode 4. Fermentation broth was centrifuged at 4,000 rpm for 10 min and PMV (packed mycelium volume) was the percentage of the precipitation (v/v). The concentration of amino nitrogen was detected by formol titration method . Total sugar concentration was assayed by Fehling method after acid hydrolysis . Soluble phosphate level and total phosphorus content were measured with molybdenum blue method . The erythromycin titer was measured by the modified colorimetric method . The fermentation supernatant was collected after centrifugation and poured into the equal volume of K2CO3 solution (0.35%). Then, this solution was extracted with the equal volume of butyl acetate. Extracted erythromycin (oil phase) was mixed with the 0.1 mol/L hydrochloric acid. The aqueous phase fraction was separated with great care and further mixed with sulfate acid (18 mol/L) for 3 min. Then, the absorbance of this mixed solution was measured at 498 nm with a spectrophotometer. The standard curve of erythromycin titer was obtained using erythromycin A standard sample (97% purity). The erythromycin titer of fermentation broth was calculated according to the standard curve (y = 241.97x + 15.71, R2 = 0.998). Owing to the instability of corn steep liquor, the substitution of corn steep liquor with yeast powder was investigated. The results showed that the erythromycin production of yeast powder medium was reached to 9,746 U/mL at 192 h, which was similar to that with corn steep liquor medium (9,444 U/mL). This result indicated that yeast powder was suitable to replace corn steep liquor for the erythromycin production. By comparing the process parameters between the medium with yeast powder and the medium with corn steep liquor, the significant differences were observed that the fermentation with yeast powder medium had a much lower concentration of soluble phosphate and a much higher amino nitrogen level during the early fermentation stage as compared with that using corn steep liquor medium (Figure 1A, B). These phenomena could result from the difference in terms of the ingredients between yeast powder and corn steep liquor. The total nitrogen contents in the two media were the same because the substitution of corn steep liquor with yeast powder was based on the equal nitrogen principle. It was well known that the soluble phosphate played an important role in fermentation process optimization and erythromycin biosynthesis. The data shown that the phosphorus content in yeast powder medium (0.07 g/L) was only half of that in corn steep liquor medium (0.14 g/L). Hence, it was worthwhile to investigate the effects of phosphorus on the fermentation and the erythromycin biosynthesis. In addition, the organic acids in corn steep liquor and the microelements in yeast powder should possibly play a role in the cell growth. However, they may have a looser correlation to the levels of phosphate in the early fermentation stage as compared with phosphorus. Hence, the effects of adding and feeding potassium dihydrogen phosphate on the fermentation were investigated. Comparison between the fermentation with yeast powder medium and that with corn steep liquor medium. (A) Soluble phosphate. (B) Amino nitrogen. Figure 2A showed that the concentration of soluble phosphate in the sterilized medium was increased to approximately 0.1 g/L after potassium dihydrogen phosphate was added. It was observed that the concentrations of amino nitrogen and total sugar under strategy 1 fell to 0.16 and 13 g/L at about 30 h, respectively, which was about 18 h earlier than that of the control experiment (Figure 2B). It was reasonable to think that inorganic phosphate accelerated the consumption of amino nitrogen and starch. The maximal PMVs of mode 1 (37%) and mode 2 (42%) were slightly higher than that of the control (34%). It was also observed that the dissolved oxygen concentration (DO) of mode 2 was dramatically low (approximately 10%) during 15 to 20 h which coincided with the relatively high phosphate feed (Figure 2C). All these data supported that the metabolic activity of the cell was improved by the addition of potassium dihydrogen phosphate. Figure 2D showed that the erythromycin production under mode 1 and mode 2 were 11,918 and 12,230 U/mL, which were increased by 22.3% and 25.5%, respectively, as compared with the control. It should be noted that the biosynthesis rate of erythromycin before 36 h was significantly improved by the addition of inorganic phosphate. It was reported that the low level of free amino acids would expand the ppGpp pool in the starving cells and the ppGpp concentration was closely linked with the onset of antibiotic biosynthesis -. The possible explanation for the increase of erythromycin titer was that the high consumption rate of amino nitrogen after phosphate feed resulted in the starvation of amino nitrogen and ultimately triggered erythromycin biosynthesis earlier. Moreover, the key intermediates of primary metabolism should be increased since phosphate enhanced the primary metabolism and these intermediates provided more precursors of erythromycin . We also found that the broth viscosity became too viscous under mode 2, suggesting that phosphate was overfed (In mode 2, the final concentration of potassium dihydrogen phosphate in the initial medium was as high as 0.12 g/L). Effects of adding potassium dihydrogen phosphate to the initial medium on the fermentation process of ZL1004 strain. Mode 1: the concentration of potassium dihydrogen phosphate addition was 0.08 g/L. Mode 2: the concentration of potassium dihydrogen phosphate addition was 0.12 g/L. (A) Soluble phosphate. (B) Amino nitrogen. (C) Dissolved oxygen. (D) Erythromycin. Figure 3A showed that the concentration of soluble phosphate under strategy 2 was similar with that of the control during 6 to 24 h. Figure 3B showed that the concentration of amino nitrogen of mode 3 and mode 4 reached the lowest level at 24 and 18 h, respectively, which were earlier than that of the control (48 h). These data further confirmed that phosphate accelerated the consumption of amino nitrogen. This phenomenon reflected that phosphate was the limiting nutrient for the cell growth and feeding potassium dihydrogen phosphate in the early phase of fermentation could alleviate the phosphate limitation. Effects of feeding potassium dihydrogen phosphate on the fermentation process of ZL1004 strain. Mode 3: the solution of potassium dihydrogen phosphate (10 g/L) was fed at the rate of 10 g/h. Mode 4: the solution of potassium dihydrogen phosphate (10 g/L) was fed at the rate of 20 g/h. (A) Soluble phosphate. (B) Amino nitrogen. The erythromycin production under mode 3 (12,077 U/mL) and mode 4 (11,734 U/mL) were increased by 24.0% and 20.4%, respectively, as compared with that of the control. These data showed that feeding inorganic phosphate to improve the consumption rate of amino nitrogen was an effective way to improve erythromycin production. In our further study, feeding strategy was tested on 500-L fermenter scale. As shown in Figure 4, the consumption rate of amino nitrogen in 500-L fermenter was enhanced by feeding potassium dihydrogen phosphate. The PMV was significantly improved before 36 h. These results were well consistent with the data acquired in 50-L fermenter. The erythromycin production with feeding potassium dihydrogen phosphate was reached to 11,839 U/mL, which was 17.3% higher than that of control (10,089 U/mL, without feeding potassium dihydrogen phosphate). Hence, feeding potassium dihydrogen phosphate with amino nitrogen consumption as indicator was successfully scaled up from 50-L fermenter to 500-L fermenter. Effects of feeding potassium dihydrogen phosphate on the fermentation in 500-L fermenter. Solid symbol indicates control; open symbol indicates feed KH2PO4. Black and red squares indicate soluble phosphate; black and red circles indicate amino nitrogen; black and red stars indicate PMV; and black and red triangles indicates erythromycin. With the aim to further decrease the soluble phosphate level during the late phase of fermentation, condensed soy protein was selected as the nitrogen source since its phosphorus content (0.9%) was much lower as compared with that of yeast powder (1.2%) and corn steep liquor (1.5%). The protein content of condensed soy protein was 65.0%. 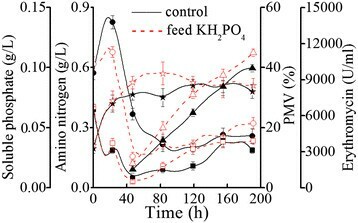 Figure 5 showed that the consumption rate of amino nitrogen with feeding potassium dihydrogen phosphate was higher than that of the control. The PMV was also improved by feeding potassium dihydrogen phosphate. The erythromycin production was reached to 11,231 U/mL, which was increased by 13.0% as compared with the control (9,941 U/mL). The material cost for erythromycin production in the medium with condensed soy protein (3.59 × 10−8 yuan/U) was cheaper than that in the medium with corn steep liquor (3.94 × 10−8 yuan/U) and yeast powder (3.78 × 10−8 yuan/U). Considering the relatively low price of condensed soy protein and the relatively high erythromycin titer, the combination of feeding potassium dihydrogen phosphate with condensed soy protein as nitrogen source showed a better prospective use on the industrial scale. Effects of potassium dihydrogen phosphate on the fermentation process of condensed soy protein. Solid symbol, control; open symbol, feed KH2PO4. Black and red squares indicate soluble phosphate; black and red circles indicate amino nitrogen; black and red stars indicate PMV; and black and red triangles indicates erythromycin. In this paper, a stable nitrogen source, yeast powder was introduced into erythromycin industrial fermentation medium in the place of the unstable nitrogen source, corn steep liquor. Considering the relatively low phosphorus content of yeast powder, a strategy of adding and feeding potassium dihydrogen phosphate was tested and the results showed that phosphate could enhance the cell growth in the early phase of fermentation and ultimately improved the erythromycin production. This strategy of feeding phosphate was successfully applied to 500-L fermenter. The further fermentation with a low-phosphorus-content nitrogen source (condensed soy protein) supported that phosphate feed combined with rational nitrogen regulation was an effective way to improve erythromycin production. This work was financially supported by a grant from the Major State Basic Research Development Program of China (973 Program, No.2012CB721006), National Natural Science Foundation of China (No.21276081), National Scientific and Technological Major Special Project (Significant Creation of New drugs, No.2011ZX09203-001-03), and Research Fund for the Doctoral Program of Higher Education of China (No.20110074110015). QZ, YC, and MH were in charge of the experiments and paper writing. YG participated in the experiments in the 500-L fermenter. JC and YPZ directed the study as the tutors. All authors read and approved the final manuscript.